Hello Friends! Thank you for your interest in my novels. I ​live and work in Chester County, Pennsylvania, an area rich in Revolutionary War and Colonial American history. My enduring interest in 18th Century America began at a young age, inspired by the novels of Dale Van Every and Allan Eckert, whose timeless tales of adventure and romance capture the essence of early American lore. Eager to read more such stories, to my disappointment I had trouble finding them on bookshelves, so I decided to write one of my own. Thus began a journey fueled by my passion to breathe life into history through believable characters, plots woven with adventure, romance and suspense and, of course, plenty of derring-do. I loved The Devil Take Tomorrow. Loved. It. How's that for a review? Well, it's definitely how I felt about this gem of a book. As a person who does a great deal of reading in the historical fiction genre, I found the plot believable, authentic, and mired in historical truths. Author Gretchen Jeannette must have truly done her homework in the writing of this novel, and it really shows. Readers of historical fiction should certainly take note of this book, but any others just looking for an excellent story should also pick it up. It is easy for me to give this book my highest recommendation, and I look forward to reading more in this excellent new series as soon as possible! The Devil Take Tomorrow by Gretchen Jeannette is a very well written novel that reminded me a bit of the Sleepy Hollow TV show, without the supernatural elements. The Devil Take Tomorrow is a fast paced novel with both romantic and intriguing elements woven together into the web of this carefully crafted historical fiction. My favorite character was actually not the spy Ethan Matlock, but Miss Maddie Graves. I found her devotion to the American people to be heartening, especially in the face of the huge opposition she faced, not only as a person interested in helping America, but also as a woman. I greatly enjoyed reading The Devil Take Tomorrow by Gretchen Jeannette and I look forward to future books by this author. I so enjoyed The Devil Take Tomorrow. Author Gretchen Jeannette has done a great job in creating realistic and relatable characters that her readers will come to care about and will root for. If that isn't a hallmark of a great author, I'm not sure what is. The story line is very exciting, full of historically accurate information that will both entertain and inform. Any reader who enjoys historical fiction, action, adventure, thrills, or just a great piece of fiction should absolutely read The Devil Take Tomorrow. I am so pleased to highly recommend this book, and look forward to reading more from the very talented author, Gretchen Jeannette as soon as I possibly can! Wow, this will make a great movie one day! I rarely say it about books, but this one was that good! It was fast-paced, meticulously researched, beautifully written and impossible to put down. I adored the main characters. They were so real that by the end of the novel I felt like I knew them all. Ethan was also an amazingly complex protagonist who can be honorable and courageous, and also can have a very dark side, which always fascinates me and makes me empathize with such characters even more. Maddie too is an incredibly strong woman, who is worth admiration. Authentic language, natural flowing dialogue and unforgettable characters really make this novel a must read for all lovers of historical fiction genre. Five huge stars. I’m what you might call a connoisseur of historical fiction. One of my favorite time periods to read about is the American Revolution. The trouble is there just aren’t enough good Revolutionary War novels out there. Those I have found are either not well written or poorly researched or rely solely on romance to drive a thin story line. “The Devil Take Tomorrow” is not only an exception, in my opinion it is THE exception on all counts. 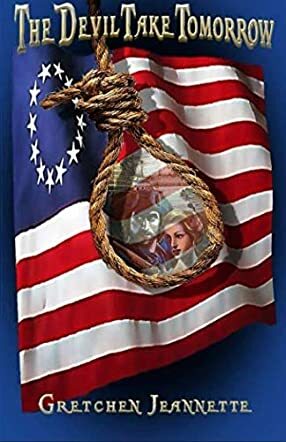 Set during the British occupation of Philadelphia in 1777, the story centers on Ethan Matlock, a rebel spy who must stop a British plot to kill his commander in chief, George Washington. This book has everything, from fascinating characters to an original, perfectly paced plot to a touching romance that compliments the adventure. Clearly this author knows how to spin a tale that will make you forget you’re reading fiction, it’s that absorbing. I highly recommend this book to any reader who enjoys historical fiction or just a darn good story.